The Marine Mammal Center : The Little Harbor Seal that Could! The Little Harbor Seal that Could! Abandoned, malnourished and suffering a nasty injury to his jaw, this little harbor seal was aptly named "Survivor" by rescuers. Animal care volunteer Ben Calvert helps feed Survivor as part of "fish school." Soon the little harbor seal pup will be able to eat fish on his own. Survivor was rescued on Leffingwell Beach, April 15, 2012, at San Simeon State Park, in Cambria, California. Survivor was down and out; his forehead and right shoulder were covered in tar, he had severe puncture wounds on top of his head and his right eye was severely swollen. Survivor still had his umbilical cord indicating he was just days old. Once at our hospital, veterinarians gave him a complete exam and x-rays revealed that the puncture wounds on top of his head were actually bite marks. The left side of his jaw had been crushed, and he had a nasal fistula - a rather large opening around his nose. Veterinarians don't know what caused all of this, but they guess it was certainly something violent such as being shaken or hit hard. X-ray shows the traumatic injuries to Survivor's jaw upon arrival at the hospital. Over time and with medical attention, these will heal. "In Survivor's case we think the fistula will close on its own and not be a disability to the animal once it does. In fact, since admit, the drainage and discomfort seem to be reducing almost every day," explained Dr. Bill Van Bonn, Director of Veterinary Science at The Marine Mammal Center. As bad as it sounded for Survivor, the prognosis for this animal is good! As of May 25, Survivor has been going through fish school eating about 4 lb of herring a day despite his jaw injury. Give a seal a meal - Dollar-a-Pound! 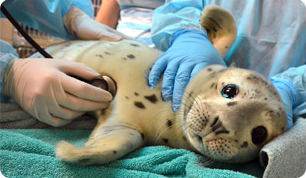 Adopt-a-Seal today and support future patient care!